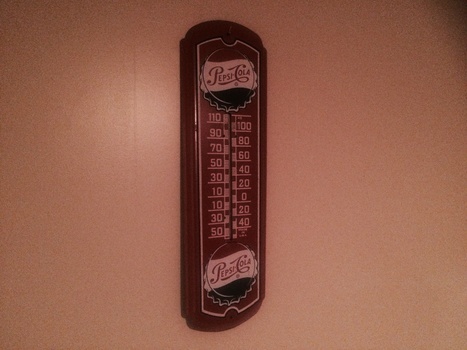 In Advertising > Pepsi > Show & Tell and Advertising > Advertising Thermometers > Show & Tell. Found this little gem yesterday for $40.00!!!! I am still grinning from ear to ear:) It's in such great shape you can tell it's been loved for a long time. The seller said his grandpa gave it to him and he had a Merita Bread sign with the Lone Ranger on it too. I do hope he calls me back with a price as good as this!!! Happy Hunting!!!!!!!! Thanks for the love and nice comment vetraio50. Thanks for the love aghcollect. That is a great price. Would sell for 2-3 times that price here. Thanks for the love ttomtucker. Nice one Trey!!! Lucky you!!! Just a fantastic find!!! Thanks for the love mikelv85. Thanks for the love DaveSierra. Thanks for the love vintagelamp. It is a beauty, and I'm glad that you got it…especially at such a good price! Good luck on the other items, too! Thanks for the love and nice comment Jewels. Thanks for the love and nice comment SEAN68. Thanks for the love Manikin. Thanks for the love gargoylecollector. Thanks for the love katherinescollections. Wonderful, I am happy for your find. I know that feeling of a lucky Hunt :). Thanks for the love Roycroftbooksfromme1. Thanks for the love Rustfarm. Thanks for the love surfdub66. As a collector I'm guessing you want to know the truth so I'm going to go ahead and tell you that your Pepsi thermometer is not from the 1950s. This particular item was sold by stores like K-Mart in the 1980s as a home decor item. People are always selling them on eBay and they often misrepresent the age, probably because they just don't know any better. I once saw a picture on the Internet of one still in the original cardboard box. Just thought you'd want to know. Up early or staying up late ? Morning Trey. Thanks for the love Caperkid:) up way to early, can't sleep it's 3:29 am in sunny Florida! !